Quarter to date comparable store sales are down 7.4%. Year-to-date sales are down 3.9%. For the full year ending February 1, 2014, the Company expects our reported net loss attributable to Holdings’ shareholders will be between $1.3 billion and $1.4 billion. 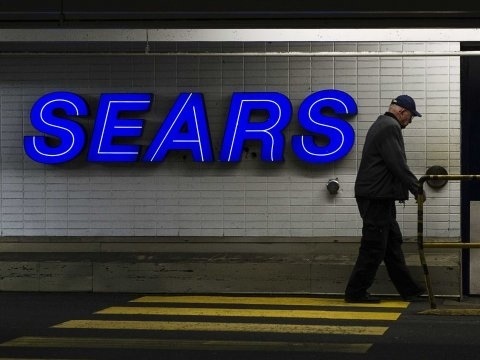 Once an iconic brand, it was reported in 2012 that Sears said it would close 120 Sears and Kmart stores in an effort to get the company back on track. HOFFMAN ESTATES, Ill., Jan. 9, 2014 /PRNewswire/ — Sears Holdings Corporation (“Holdings,” “we,” “us,” “our,” or the “Company”) (SHLD) today is providing an update on our quarter-to-date performance and financial position. During the quarter, we continued to proactively transform our business to a member-centric integrated retailer leveraging our Shop Your Way™ (“SYW”) program and platform. As previously stated, we are transitioning from a business that has historically focused on running a store network into a business that provides and delivers value by serving its members in the manner most convenient for them: whether in store, in home or through digital devices. We are driving this transformation by investing in capabilities to enable members access to the broadest possible assortment of products and services, enhancing our membership benefits associated with SYW, developing digital and social relationships with our members, using data and analytics to make targeted offers and decisions delivered in real time and expanding our reach through Marketplace and delivery options. Total domestic comparable store sales for the quarter-to-date period declined 7.4%, comprised of decreases of 5.7% at Kmart and 9.2% at Sears Domestic. Kmart’s quarter-to-date comparable store sales decline reflects declines in most categories including consumer electronics, grocery & household and toys. Sears Domestic’s quarter-to-date comparable store sales decline is attributable to decreases in most categories including consumer electronics, tools and home appliances. Sears Canada comparable store sales for the quarter-to-date period ended January 6, 2014 were -4.4%. We currently expect consolidated Adjusted EBITDA, which excludes certain significant items as set forth below, for the fourth quarter will be between $(65) million and $65 million, as compared to $429 million in last year’s fourth quarter. We expect fourth quarter domestic Adjusted EBITDA of between $(80) million and $20 million, as compared to $365 million for last year’s fourth quarter. We expect that Sears Canada fourth quarter Adjusted EBITDA will be between $15 million and $45 million, as compared to $64 million last year. Please see the Adjusted EBITDA reconciliation below. We currently expect our reported net loss attributable to Holdings’ shareholders for the quarter ending February 1, 2014 will be between $250 million and $360 million, or between $2.35 and $3.39 loss per diluted share. This includes $41 million of pension expense, $29 million for store closures and severance and $12 million from gains on sales of assets. Adjusted for these items, net loss is expected to be between $213 million and $316 million, or between $2.01 and $2.98 loss per diluted share. The ranges exclude the impact related to the Sears Canada real estate transactions previously announced, restructuring activities including severance, store closings and impairment charges, an estimated non-cash charge of approximately $145 million related to the establishment of an additional valuation allowance against our state separate entity deferred tax assets, as well as other tax related matters and any non-cash impairment charges for fixed assets. In the fourth quarter of the prior year, the Company reported a net loss attributable to Holdings’ shareholders of $489 million, or $4.61 loss per diluted share, which included a non-cash charge of $455 million related to pension settlements, non-cash impairment charges of $330 million and other adjustments which can be found in our 8-K filed on February 28, 2013. Adjusted for these items, the Company reported net income of $119 million, or $1.12 per diluted share. For the full year ending February 1, 2014, the Company expects our reported net loss attributable to Holdings’ shareholders will be between $1.3 billion and $1.4 billion, or between $11.85 and $12.88 loss per diluted share, which includes the fourth quarter-to-date items noted above, as well as the year-to-date adjustments disclosed in our third quarter 10-Q report filed on November 21, 2013. Adjusted for these items, net loss is expected to be between $811 million and $914 million, or between $7.64 and $8.61 loss per diluted share. The ranges exclude the impact related to the Sears Canada real estate transactions previously announced, fourth quarter restructuring activities including severance, store closings and impairment charges, an estimated non-cash charge of approximately $145 million related to the establishment of an additional valuation allowance against our state separate entity deferred tax assets, as well as other tax related matters and any non-cash impairment charges for fixed assets. For the full year ended February 2, 2013, the Company reported a net loss attributable to Holdings’ shareholders of $930 million, or $8.78 loss per diluted share, which included a non-cash charge of $455 million related to pension settlements, a non-cash impairment charge of $330 million and other adjustments which can be found in our 8-K report filed on February 28, 2013. Adjusted for these items, net loss was $215 million, or $2.03 loss per diluted share. As previously announced, we are evaluating separating both our Lands’ End business and Sears Auto Center (“SAC”) business. On December 6, 2013 we filed with the Securities and Exchange Commission a registration statement on Form 10 related to the spin-off of Lands’ End through a potential pro rata distribution to Holdings’ shareholders. We are considering strategic alternatives for our SAC business, any of which would be subject to approval by Holdings’ Board of Directors and other conditions. In addition, we continue to reduce unprofitable stores as leases expire and in some cases accelerate closings when circumstances dictate. Results are preliminary and unaudited. This press release contains forward-looking statements about our expectations for the fourth quarter of fiscal 2013, our transformation through our integrated retail strategy and possible transactions discussed elsewhere in this press release. Forward-looking statements are subject to risks and uncertainties that may cause our actual results, performance or achievements to be materially different from any future results, performance or achievements expressed or implied by these forward-looking statements. Such statements are based upon the current beliefs and expectations of our management and are subject to significant risks and uncertainties. The following factors, among others, could cause actual results to differ from those set forth in the forward-looking statements: our ability to offer merchandise and services that our customers want, including our proprietary brand products; our ability to successfully implement our integrated retail strategy; our ability to successfully implement initiatives to improve our liquidity through inventory management and other actions; competitive conditions in the retail and related services industries; worldwide economic conditions and business uncertainty, including the availability of consumer and commercial credit, changes in consumer confidence and spending, the impact of rising fuel prices, and changes in vendor relationships; our ability to complete possible transactions with respect to Lands’ End and/or Sears Auto Centers on terms that are acceptable to us, on intended timetables or at all and the impact of the evaluation and/or completion of those transactions on our other businesses; the potential impact on our business and our relationships from any such transactions; our ability to successfully achieve our plans to generate liquidity, reduce inventory and reduce fixed costs; conditions and possible limits on our access to capital markets and other financing sources; vendors’ lack of willingness to provide acceptable payment terms or otherwise restricting financing to purchase inventory or services; the impact of seasonal buying patterns, including seasonal fluctuations due to weather conditions, which are difficult to forecast with certainty; our dependence on sources outside the United States for significant amounts of our merchandise; our extensive reliance on computer systems, including legacy systems, to implement our integrated retail strategy, process transactions, summarize results and manage our business, which may be subject to disruptions or security breaches; our reliance on third parties to provide us with services in connection with the administration of certain aspects of our business and the transfer of significant internal historical knowledge of such parties; impairment charges for goodwill and intangible assets or fixed-asset impairment for long-lived assets; our ability to attract, motivate and retain key executives and other associates; our ability to protect or preserve the image of our brands; the outcome of pending and/or future legal proceedings, including product liability claims and proceedings with respect to which the parties have reached a preliminary settlement; and the timing and amount of required pension plan funding; and other risks, uncertainties and factors discussed in our most recent Annual Report on Form 10-K and other filings with the Securities and Exchange Commission. We intend the forward-looking statements to speak only as of the time made and do not undertake to update or revise them as more information becomes available.